@Jim looking at your tree, I notice the background leaves could be used as a general background for the whole area. I'll try something with your style if you don't mind. - Sloths, because sloths are like the coolest animals in the entire world. Go ahead man. I've got a more resent one with the leaves that I am currently working on if you want. Also, new page. Maybe the person with the first comment on a page should copy over the "to do" list and all of Ellian's ideas? 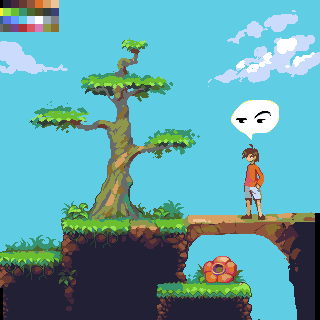 That's not a tile-set lol, just the layer behind the tree. But it's better than nothing right. Tent update, and a few tiles for a hollow log. I'm not sure which log would fit the style better. I know that it's supposed to be a bit more cartoony, but which one fits better? I would love to see moss (similar to the grass) on that hollow log for the jungle aspect. Also go for the left one without texture but break the straight shade. Thanks Jim for the idea of editing my post. Did it like you asked. I would like to remind everyone that all everything you post in here gets CC-BY licensed. Would all the contributers be so kind to state somewhere that you agree to this? 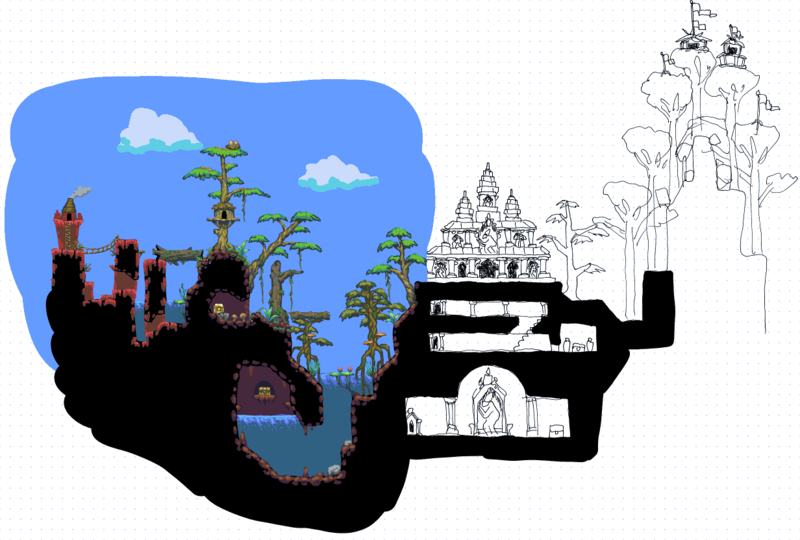 Also, here is my update on the temple tiles. I will leave them like this for a while until I better know what I want with them, but feel free to take over, add, edit, make suggestions about its functionality etc etc..
Ok! Here's what I though could work good for the background. I though Jim's leaves lacked a bit of depths. I did 2 modifications to change this. -Added 1 green color in low quantity. -put more of the darker blue. This is what I came up with. 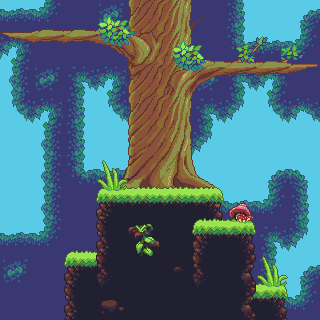 I will do more of the tileset but I hope to get C+C before I finish. @Hap The faces looks weird and funny. I though there would have more serious statues/faces on the temple's rock. NP, I think what we might need for a leave background pattern is a full leave image. The edges around the tree have already been done by Jim anyway (and very nicely in my opinion). However, these could overlap another pattern which could fill up a lot of space around the tree. This would then probably only be 2 colors only (otherwise they distract too much), perhaps two different types (one foreground, one background) and their edge tiles. (so 18 tiles in total, centre, top bottom left right and all diagonals, and that in a dark and in a light version. You would mean something like this? 3 colors each, the right one obviously have a darker blue. Which one's your favorite. It's easy to switch anyway. I don't know yet the colors I would pick to do the light version. Also I count more then 9 tiles for each Don't forget there are inside and outside corners. That would make 13 tiles each. What up with the furry tree? What do you guys think about this. I still need to do the 4 "inside corners" i mentioned earlier. Also I like the darker version better. It's too square and smooth. And what's it supposed to be, trees? Why not just draw out a tree and put it in the background? I think when people make tiles they think about them being tiles too much. Ok, ok, nope, not sure what to say to you. 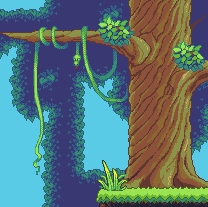 Anyway, I probably shouldn't of posted that last image like that, the leaves aren't meant to outline the tree, I just used the trees out line to make sure the tiles, well, tiled. The plan is for those leaves to end up looking like the silhouette of the trees canopy. The reason for the trees being tiled, is so that they can be used as platforms? If we're doing it wrong, you're more than welcome to pave the way though. I like the creature designs, keep going.Specifically the slug. I like the look of the tree Jim. Gives it a unique feeling. I think skeddles was talking about the leaves pattern, the tree looks perfect as it is. As for the leaves pattern, I like the right one a lot! And it is a big improvement on the last pattern you posted. Slug and mosquito are my favorite, keep it up! It's too squared indeed. I'll change the tiles. It's not that hard of a design to do anyway. I tried to see if it could also be used around Jim's tree. Waiting for his reply. This looks great! It is indeed hard to not make things look squared..
Noburo, I edited your tent a tiny little bit and added it to the tileset! (see first post). As for the log, maybe something inbetween version one and two? Not no detail at all, but also not a too textured feel to it. 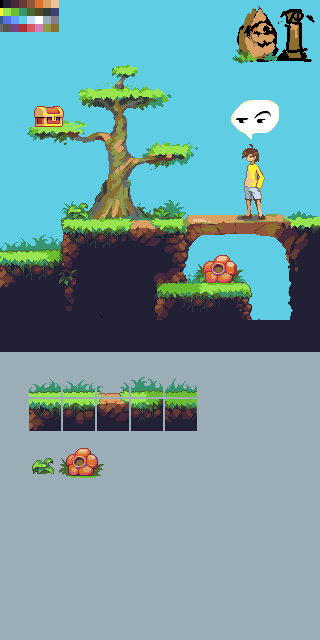 Also, as much as I like it when things can be used as tiles, consider if a standalone version might work better so you can give it a bit of perspective. I just realize, maybe the golems feet should be given flat bottoms too, to match , or at least be both on the same level? Feel free to make a new mashup with these. I kind of assumed that my posting work to this thread meant that it was for use with the project. So do I agree to the terms and licensing agreement? Umm... yes. The tent edit looks definitely has improved the appearance, but it looks like you may have added a couple stray pixels in the process. On the right side of the tent, there are 4 brown pixels in a line. 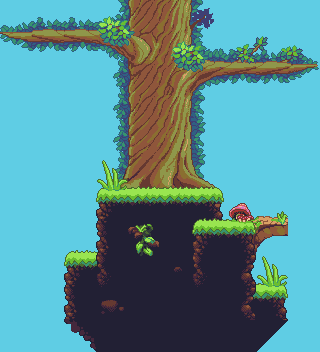 As far as the log goes, I'm not too happy with the way it's turning out, so I will likely scrap it and start over. As you mentioned, I was trying to make it tileable while at the same time giving it a bit of a dynamic angle, but instead it just looks cloodgy. I may just make 2 different logs. That leave/canopy tiles are really nice. Really interesting way to put some depth to the background, I love it! 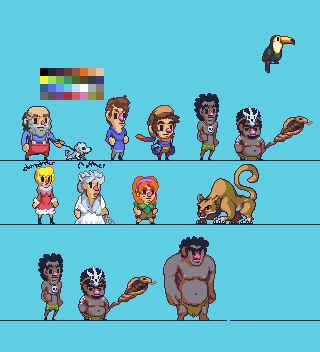 Here are some more jungle creatures. The mandrill ain't really good but oh well... Had much fun on the toucans, though. Thanks for noticing, I don't know how I did that. A toucan was so much on my wishlist, if noone else had picked it up I would have started it myself! Are you up for animating it? It sits so nicely, it would be great to have creatures that sit down, fly away and sit down again! Or that it is kind of avoiding/following you, but it will only attack if you come too close ;). If you are not going to animate it I might give it a shot later on. I think it can look less like a penguin and more like a toucan! Great stuff, I put it in the top post. I could not help but slightly edit it though and removed all the micro leaves which I found distracting and unnessecary.. Do you agree? 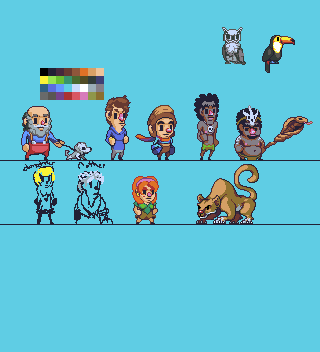 And just go ahead with animation, I still have to work on that leopard/panther thing that will take days, and I want to fully animate the frog as well. I am still not sure about the drop thing. Most important was stretching out the body and raising the level of the beak. Toucan hops, toucan watches you when you are below or above him. I still need him to schreech, attack and fly.. Flying is going to be hard..
Of course I will export proper files without the bg when done. I'm really busy at work getting ready for an event until Sunday (putting in extra hours), so don't expect to see much from me until after then. I love you guys for making a Toucan and animating it! Seriously though, it looks great.<---edit, can't stop looking at that animation, mesmerized. NP, you don't need my permission, you're doing a great job. Everything you've made so far really outshines the two things in your gallery. 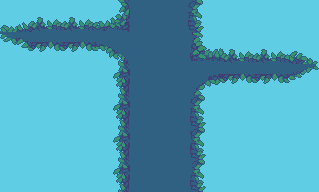 Anyway, the way I see it, both leaf tiles will/can be used. Variety is the spice of life as they say. I am still not sure about the drop thing. Most important was stretching out the body and raising the level of the beak.Ill give animating a shot :) Toucan hops, toucan watches you when you are below or above him. I still need him to schreech, attack and fly.. Flying is going to be hard.. Of course I will export proper files without the bg when done. That's the sexiest toucan ever. Also, I love these little characters. It may be starting to go a little overboard, but they are so fun to make. @Hapiel: Holy crap that looks amazing. I hope I can get up to that level of skill some day. I love that toucan. Also I don't mind the edit on the leaves I made. I actually like it better like that. The log looks better like that. I like the version with grass and moss. For the character, the lines are a bit straight around the head, the back and the legs. Either way, here is some stuff. Critique is welcome. Flying animation is tested in motion and seems to work quite well! I did some quick work trying to find a style for the thorn idea. But I'm stuck on what shape it should have for it to work with everything we've done so far. Also going to sleep soon so I might as well tell everyone what've I done tonight in case I find updates tomorrow morning. Looking good so far, that would make a decent pit trap, right? You should add a darker outline, mostly on the thorns/upper part of the vine, that'd fit the style a tad more. Maybe add more contrast overall; thorns aren't exactly a background element, they're more like a gameplay asset, so they probably need to pop out more? The animation doesn't look too bad at all, however I do think that it could look more like a frog than it currently does. Look up some frog references on google images. I think the biggest thing for me is the arch of the back. Here's an edit I forgot to post. Hey A3um, great work! I really like the new base tiles you created, perhaps you could update the old ones and add the new ones, and cut them out as tiles? Also, make sure to read the style guide, http://www.pixeljoint.com/forum/forum_posts.asp?TID=16248&PN=1 , it contains all information you need to match the style so far. Outlines, palette etc. @||||, It's almost floating trough the air! How do you envision it being used? In what way would it be clear that this is not a 'monster' but a background object? The flower looks visually like an improvement, but I am afraid that it might be too prominent now. Background items should stay background items, right? The grass I made is far from perfect, but you have definitely over detailed that one as well ;). Oh, it is hard to create something that holds together! Any tips for how I can improve the style guide? Anyone? 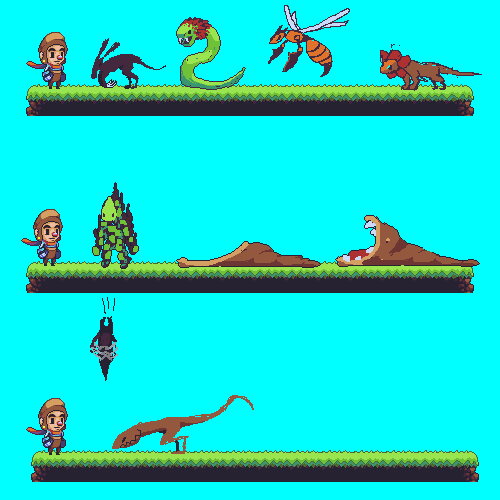 At the end of the weekend/monday I will create a new mockup from all the most recent stuff and put it in the front post, the more icons are broken up into tiles (like the snake without the BG), the easier it is to work with for me! I believe you need to link the license on that forum if it's to be used there. Jim16: Nice edit on the frog.. much more frog-like than mine. I'd edit it but Hapiel pointed out that it probably would read as more of a monster/ enemy sprite than a friendly BG char.. but anyway i just made it for fun. I think the movement could be easily edited to not float.. by speeding up the air frames and making the leap shorter. But why would I bother when I could make something actually useful? I love it but sadly it doesn't match the style we chose. I like the way you put vines in the ground. I made an edit of the girl in the image below. love the log btw. I tried to finish some of the characters I started as well as add to what's already been made. My favourite are the forest men. Please let me know what could be changed or edit these. Jim, I'll remind you we still don't have usable tiles of your tree. Can you do that before Hapiel comes back? I might scrap the tree and try and incorporate something more like A3um's tree. 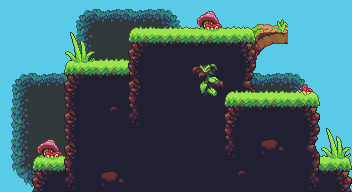 We'll see, I guess I'm just a bit hesitant to post tiles of something I'm not proud of (yet) (I'm a bit of a perfectionist :/ ). Edit: a bit of an update, everything is still WIP, specifically the ones I've just added. I think the flower is best in match right now. That just needs to be cut out and then its done :). The material that would be hidden by this tile would be useful as well in case another top tile is used, or perhaps the tree could overlap the top tiles as the grass tile does on the left tile here. As long as it would be obvious that the player can walk in front of this (the player/monsters stand on the white line in the example above). I really like your redesign of the rocks on the side of the floor tiles.. If they would be cut out into 32x32 tiles that would be awesome! 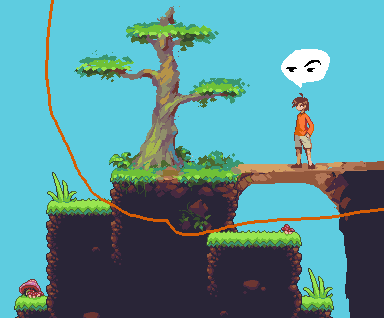 Also, perhaps the grass needs to be bright on top (as the example), for it to match with what we have so far. Playing with a large-scale concept.